Join our team! Check out YEP-National's open positions and apply today! We believe that education in the United States will be improved if education professionals connect with each other in a range of environments. Often, young education professionals only interact with peers in their own offices or schools, and rarely have the opportunity to discuss education with those who share their passion but approach the issue from a different perspective. 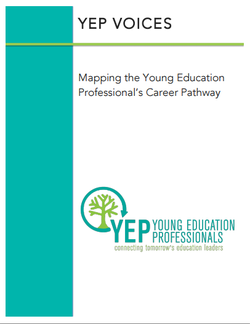 Young Education Professionals (YEP) is attempting to break down the barriers between education policy, practice, and research by facilitating social and professional connections between young education professionals. We believe that as a result of the networks we support and cultivate, as our members become tomorrow’s education leaders, our education system will benefit greatly from a more cohesive and productive education sector. Who are young education professionals? Young education professionals include administrators, entrepreneurs, policymakers, researchers, teachers, and more. Young education professionals work in education management, for profits, governments, nonprofits, policy organizations, schools, and think tanks. This group is open to all current, former, and aspiring young education professionals.